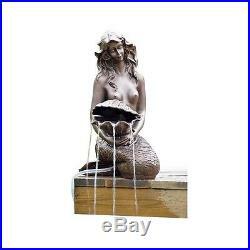 Solar Garden Mermaid Pond Water Fountain with 5W Solar Panel 500 LPH Pump Kit. 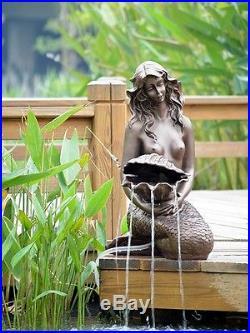 Overview: Give your backyard a tropical feel with this free standing mermaid pond water fountain from ASC. Visitors will be drawn to this eye popping, summer centerpiece; So, you will want to ensure that it is positioned at a focal point in your yard. You and your guests can relax by listening to the gentle trickle of water as it flows through the opening of the clam that the mermaid is holding. You can also rest easy knowing that this fountain runs on solar power, meaning that you can save on your electric bill. Features: Operates in direct sunlight only Low voltage water pump with filter recycles the same water. Creates the sound of gentle running water Fountain dimension: 30" H x 15.75" W x 18.5" L Package dimension: 32" H x 17" W x 21.5" L Solar Water Pump Specifications: Max. Water Flow: 500 LPH Solar module: 5.0 W DC brushless pump operation voltage: DC 15V Max Water lift: 44 inches Solar panel dimensions: 10.6 inches long x 9.3 inches wide Battery: not included Contents: 1 x Pump kit 1 x Fountain 1 x Manual. Defective products must be reported within 3 days from the date you receive your order. Your satisfaction is important to us! Actual transit time might fluctuate. We are not responsible for image and typographical errors. Please checkout only after all your auctions have ended. You are only allow to checkout once. Once checkout is completed, you are not able to combine additional auctions. Powered by Solid Commerce The All-in-One Listing, Inventory & Order Management Solution. The item "Solar Garden Mermaid Pond Water Fountain with 5W Solar Panel 500 LPH Pump Kit" is in sale since Tuesday, May 24, 2016. This item is in the category "Home & Garden\Yard, Garden & Outdoor Living\Ponds & Water Features\Outdoor Fountains". The seller is "toolsoption" and is located in South El Monte, California.